Smartphone mount adapter kit is compatible with smartphones up to 3.6” wide, including iPhone 7 and 7 Plus, iPhone 6S Plus and 6 Plus, 6S, 6, 5, 5S, 5C, and SE, Samsung Galaxy Note 5 and Note 4, Galaxy S7, S6, and S5, LG G5, G4, and G3, Nexus 5, HTC One M9, One M8, and One Max, Nokia Lumia 1520 and 1020, Motorola Moto G and Moto X. 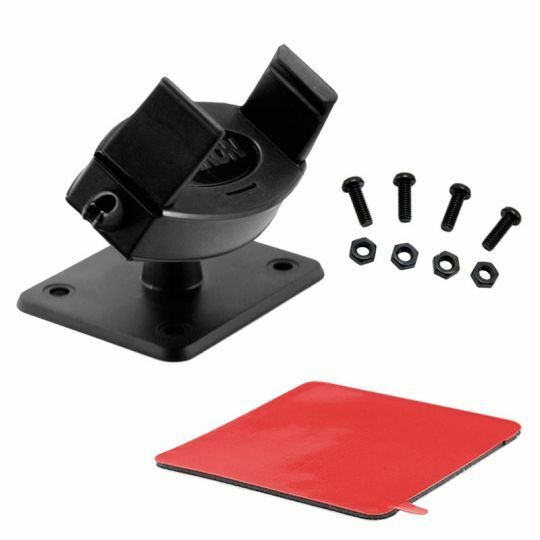 This mount includes Arkon’s Mobile Grip 2 Universal Smartphone Holder and low-profile pedestal with both adhesive and drill mount options. The mount’s swivel ball adapter head rotates 360°, providing the ultimate flexibility in positioning the device at any angle. The mount uses tough 3M VHB adhesive to adhere to vehicle-specific mounts, including those offered by ProClip, Pro.Fit, and others. WARNING: 3M VHB adhesive is designed to be a PERMANENT solution. Use of this product may result in permanent adherence to the selected surface. Professional strength solvents or tools may be helpful in removing the adhesive. Arkon is not responsible for any damage caused to your vehicle or other surface due to the installation of this product. A screw pack is also included for a more permanent installation. Important: drilling directly into the vehicle body could cause permanent damage. Use caution and consult a mobile install professional to avoid drilling into any highly sensitive motorcycle components.